The endogenous oxytocin system changes and matures over time as part of normal development. This paper postulates that individual factors and early external influences (i.e. parenting, stress and illness) affect the developing endogenous oxytocin system and its connectivity with other systems affecting oxytocin levels and alter responsiveness of the oxytocin system. When an individual is exposed to alcohol and drugs in adolescence, these individual differences in the endogenous oxytocin system can affect reward seeking and drug use behaviour. It is postulated that for example drug use may be more rewarding resulting in an escalation of use; an imbalance between natural and drug rewards could affect the attractiveness of excessive drug use; individuals may be more susceptible to stress-induced relapse to drug use. Although drugs exert their effects via different receptor systems, several brain regions are involved in drug abuse in general. Brain regions that are central to drug reward are part of the mesolimbic dopamine pathway, including the nucleus accumbens (NAcc) and the ventral tegmental area (VTA). These regions extend to the prefrontal cortex (PFC), which is critical for executive functioning and decisions concerning drug use. The dopamine reward pathway seems to be central in robust drug reward. The limbic system (including the VTA, NAcc and hippocampus) as a whole is important in emotion, drive, and memory processes that affect addiction. The HPA-axis is also a player that influences continued drug use, withdrawal and relapse (Koob, 2008). The systems listed below are of particular importance as they play an important role in addiction and they are influenced by the oxytocin system. Different drugs act on different neurotransmitter systems, but nearly all drugs of abuse eventually result in an increase in dopamine in the mesolimbic dopamine system reward pathway (Pierce and Kumaresan, 2006). Neurotransmitter systems that are key to drug effects are the dopamine system (for example, stimulants and MDMA), opioid system (heroin, codeine and alcohol), serotonin (for example, MDMA and hallucinogens), GABA and glutamate (for example, alcohol and benzodiazepines), and the cannabinoid system (cannabis) (Parolaro et al., 2005). Beyond their role in direct drug effects, many of these systems seem to be involved in susceptibility to the development of addictions (Buisman-Pijlman et al., 2009, Maldonado et al., 2006, Mechoulam and Parker, 2013 and Parolaro et al., 2005). Stress can increase vulnerability to drug addiction (see introduction) and trigger relapse to alcohol and drug use after a period of abstinence (Shalev et al., 2010). Sinha et al. (2011) provide a good overview of the role stress can play. Corticotropin releasing factor (CRF) is an central factor in the regulation of the HPA-axis in response to stress, and CRF has been implicated in the negative reinforcing effects of drugs after prolonged drug use (Koob, 2008). Neuropeptides have been of interest to addiction research for several decades but have not taken centre stage. In the 1980s, the effect of oxytocin administration became a focus of preclinical addiction research (Kovács et al., 1998 and Sarnyai and Kovacs, this issue). Recent studies are also showing that oxytocin is released in response to, for example, acute MDMA (ecstasy) and methamphetamine administration both from human (Dumont et al., 2009 and Wolff et al., 2006) and animal studies (Broadbear et al., 2011 and Thompson et al., 2007). 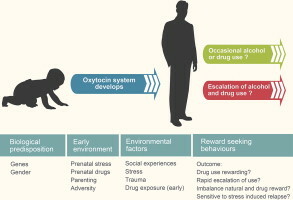 Over the years several effects of oxytocin on drug taking behaviour were demonstrated showing effects on various phases of drug use. Kovacs showed early on that centrally acting oxytocin inhibited the development of tolerance to morphine, and decreased the symptoms of morphine withdrawal in mice, while reducing self-administration of heroin in rats (Ibragimov et al., 1987, Kovács et al., 1985 and Kovács et al., 1998). Central oxytocin injections in animals were effective in modulating other drug-related behaviours. Oxytocin was found to dose-dependently decrease cocaine-induced hyperlocomotion, and stereotyped grooming behaviour (Kovács et al., 1998). Systemic administration of oxytocin was shown to have intrinsic reinforcing properties, and was able to affect drug-taking behaviour of drugs of abuse. This overview suggests that oxytocin administered both centrally or in the peripherally can attenuate drug-taking behaviour in different phases of drug use.